The Rottweiler is a medium to large size breed of domestic dog that originated in Rottweil, Germany. The dogs were known as "Rottweil butchers' dogs" (German: Rottweiler Metzgerhund) because they were used to herd livestock and pull carts laden with butchered meat and other products to market. Some records[which?] indicate that earlier Rottweilers may have also been used for hunting, although the modern Rottweiler has a relatively low hunting instinct. The Rottweiler was employed in its traditional roles until the mid-19th century when railroads replaced droving for getting livestock to market. While still used in herding, Rottweilers are now also used in search and rescue, as guide dogs for the blind, as guard or police dogs, and in other roles. The breed's history dates to the Roman Empire. In those times, the Roman legion travelled with their meat on the hoof and required the assistance of working dogs to herd the cattle. One route the army travelled was through Württemberg and on to the small market town of Rottweil. The principal ancestors of the first Rottweilers during this time are believed to be the Roman droving dog, local dogs the army met on its travels, and dogs with molosser appearance coming from England and the Netherlands. This region was eventually to become an important cattle area, and the descendants of the Roman cattle dogs proved their worth in both driving and protecting the cattle from robbers and wild animals. Rottweilers were said to have been used by travelling butchers at markets during the Middle Ages to guard money pouches tied around their necks. However, as railroads became the primary method for moving stock to market, the breed had declined so much that by 1900 there was only one female to be found in the town of Rottweil. The build up to World War I saw a great demand for police dogs, and that led to a revival of interest in the Rottweiler. During the First and Second World Wars, Rottweilers were put into service in various roles, including as messenger, ambulance, draught, and guard dogs. Deutscher Rottweiler-Klub (DRK, German Rottweiler Club), the first Rottweiler club in Germany, was founded January 13, 1914, and followed by the creation of the Süddeutscher Rottweiler-Klub (SDRK, South German Rottweiler Club) on April 27, 1915 and eventually became the IRK (International Rottweiler Club). The DRK counted around 500 Rottweilers, and the SDRK 3000 Rottweilers. The goals of the two clubs were different. The DRK aimed to produce working dogs and did not emphasize the morphology of the Rottweiler. The various German Rottweiler Clubs amalgamated to form the Allgemeiner Deutscher Rottweiler Klub (ADRK, General German Rottweiler Club) in 1921. This was officially recorded in the register of clubs and associations at the district court of Stuttgart on January 27, 1924. The ADRK is recognised worldwide as the home club of the Rottweiler. In 1935 the Rottweiler was officially recognized by the American Kennel Club. In 1936, Rottweilers were exhibited in Britain at Crufts. In 1966, a separate register was opened for the breed. In fact, in the mid 1990s, the popularity of the Rottweiler reached an all time high with it being the most registered dog by the American Kennel Club. The skull is of medium length, broad between the ears. The forehead line is moderately arched as seen from the side, with the occipital bone well developed without being conspicuous. The stop is well defined. The Rottweiler nose is well developed, more broad than round, with relatively large nostrils and always black. The muzzle should appear neither elongated nor shortened in relation to the cranial region. The nasal bridge is broad at the base and moderately tapered. The lips are black and close fitting with the corner of the mouth not visible. The gums should be as dark as possible. Both the upper and lower jaws are strong and broad. According to the FCI Standard Rottweilers should have strong and complete dentition (42 teeth) with scissor bite, the upper incisors closely overlapping the lower incisors. The zygomatic arches should be pronounced. The eyes should be of medium size, almond-shaped and dark brown in colour. The eyelids are close fitting. The ears are medium-sized, pendant, triangular, wide apart, and set high on the head. With the ears laid forward close to the head, the skull appears to be broadened. The skin on the head is tight fitting overall. When the dog is alert, the forehead may be slightly wrinkled. Natural bob tailed ("stumpy") or if present the tail was historically docked. Docking is banned in many countries, but remains legal in others, notably the USA and New Zealand. According to the FCI Standard an un-docked Rottweiler tail is "level in extension of the upper line; at ease it may be hanging". The Rottweiler is a trotting dog. In movement the back remains firm and relatively stable. Movement is harmonious, steady, full of energy and unrestricted, with good stride. The coat consists of an outer coat and an undercoat. The outer coat is of medium length, coarse, dense and flat. The undercoat should be present on the neck and thighs. The undercoat must not show through the outer coat. Rottweilers living in hot climates may have acclimatised and may be missing the undercoat. Rottweiler coats tend to be low maintenance, although they experience heavy shedding prior to their seasons (females) or seasonally (males). Technically a "medium / large" breed, according to the FCI standard the Rottweiler stands 61 to 69 cm (24"-27") at the withers for males, 56 to 63 cm (22"-25") for females, and the weight must be between 50 to 58 kg (110-130 lbs) for males and between 40–48 kg (90-105 lbs) for females. Weight must be relative to height. A Rottweiler in an all breeds conformation show. According to the FCI Standard, the Rottweiler is good-natured, placid in basic disposition, very devoted, obedient, biddable and eager to work. Their appearance is natural and rustic, their behaviour self-assured, steady and fearless. They react to their surroundings with great alertness. The American Kennel Club says it is basically a calm, confident and courageous dog with a self-assured aloofness that does not lend itself to immediate and indiscriminate friendships. A Rottweiler is self-confident and responds quietly and with a wait-and-see attitude to influences in its environment. It has an inherent desire to protect home and family, and is an intelligent dog of extreme hardness and adaptability with a strong willingness to work, making them especially suited as a companion, guardian and general all-purpose dog. Rottweilers are a powerful breed with well-developed genetic herding and guarding instincts. As with any breed, potentially dangerous behavior in Rottweilers usually results from irresponsible ownership, abuse, neglect, or lack of socialization and training. However, the exceptional strength of the Rottweiler is an additional risk factor not to be neglected. It is for this reason that breed experts recommend that formal training and extensive socialization are essential for all Rottweilers. According to the AKC, Rottweilers love their owners and may behave in a clownish manner toward family and friends, but they are also protective of their territory and do not welcome strangers until properly introduced. Obedience training and socialization are musts. A 1997 report by the CDC on dog-bite-related fatalities in the U.S. reported that Rottweilers were the second most likely dog to be involved in fatal dog attacks on humans (29 deaths over 20 years), after Pit Bulls (60 deaths over 20 years). Breed-specific bite rates are not known, and less responsible owners being drawn to certain breeds may be a factor. [original research?] Dogs bite approximately 4.7 million people in the U.S. each year, with fewer than 30 dog-bite-related human fatalities from a total dog population estimated by the American Pet Products Association at 77.5 million dogs. A 2008 study surveying breed club members found that while Rottweilers were average in aggressiveness (bites or bite attempts) towards owners and other dogs, it indicated they tend to be more aggressive than average towards strangers. This aggression appears correlated with watchdog and territorial instincts. According to the American Kennel Club Rottweilers have a natural gathering style with a strong desire to control. They generally show a loose-eye and have a great amount of force while working well off the stock. They make much use of their ability to intimidate. The Rottweiler often carries the head on an even plane with the back or carries the head up but with the neck and shoulders lowered. Some females lower the entire front end slightly when using eye. Males also do this when working far off the stock in an open field. This is rarely seen in males when working in confined spaces such as stock yards. The Rottweiler has a reasonably good natural balance, force-barks when necessary, and when working cattle uses a very intimidating charge. There is a natural change in forcefulness when herding sheep. When working cattle it may use its body and shoulders and for this reason should be used on horned stock with caution. The Rottweiler, when working cattle, searches out the dominant animal and challenges it. Upon proving its control over that animal it settles back and tend to its work. When working with sheep the Rottweiler shows a gathering/fetching style and reams directions easily. It drives sheep with ease. In some cases Rottweilers have begun herding cattle without any experience at all. If worked on the same stock for any length of time the Rottweiler tends to develop a bond with the stock and will become quite affectionate with them as long as they do as it says. Rottweilers are a relatively healthy, disease-free breed. As with most large breeds, hip dysplasia can be a problem. For this reason the various Rottweiler breed clubs have had x-ray testing regimes in place for many years. Osteochondritis Dissecans, a condition affecting the shoulder joints, can also be a problem due to the breed's rapid growth rate. A reputable breeder will have the hips and elbows of all breeding stock x-rayed and read by a recognised specialist, and will have paperwork to prove it. As with any breed, hereditary conditions occur in some lines. Because of recent overbreeding, cancer has become one of the leading causes of early death in Rottweilers. 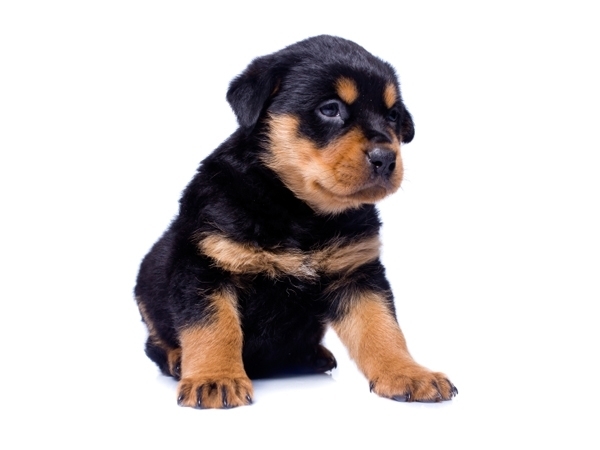 For unknown reasons, Rottweilers are more susceptible than other breeds to become infected with parvovirus, a highly contagious and deadly disease of puppies and young dogs. Parvovirus can be easily prevented by following a veterinarian's recommended vaccine protocol. If overfed or under exercised, Rottweilers are prone to obesity. Some of the consequences of obesity can be very serious, including arthritis, breathing difficulties, diabetes, heart failure, reproductive problems, skin disease, reduced resistance to disease and overheating caused by the thick jacket of fat under the skin.